It is hard to believe that we are one-third of the way as we “run toward the prize to which God calls us” this year. Our students continue to grow in wisdom and grace before our very eyes and we continue our work each day trusting that the good God will guide us in all that we do. 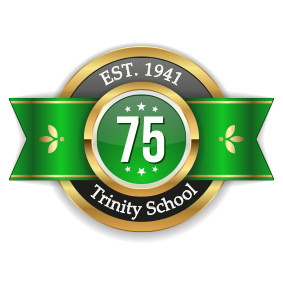 Celebrating Trinity’s rich legacy of 75 years starting with the anniversary Mass celebrated by Archbishop Lori on October 22nd has been a joy and a gift. Trinity’s history is very rich and I look forward to sharing it with you during the second semester. Now we look forward to advancing Trinity’s legacy by entering into the development of a new Strategic Plan for Trinity School. Kevin Shearer, former parent and educator, is chairing the Strategic Planning Committee. Four areas have been identified for study: Mission and Marketing, Enrollment Management, Finance and institutional Advancement, and Learning and Learning Spaces. These committees will engage in intense study and work from January through April. When the work of the committees is completed, we will share with you Trinity’s goals for the next five years. As you know we continue to work with our students to help them practice digital citizenship. While we have encouraged you, as parents, to exercise reasonable control over your child’s use of electronic devices, we are also helping our students understand the value of conversation. A first step toward that goal is to practice “no screen time” during meals and family celebrations. We hope that you will join us in this endeavor. Trinity continues to remain “green.” We have a very robust recycling program and through our monthly energy audits students are becoming very careful to conserve energy by turning off lights when not in use. May they continue this at home. Zero Waste Lunch Audits reveal that students can do more to decrease waste. Many students now bring their sandwich in a reusable container. Where they can do better is to bring their fruit, cookies and snacks in reusable containers. You can find all sizes of these containers in the grocery store. Purchase a large bag of chips instead of individual ones, and then fill the container. Get your child involved in preparing his/her lunch. As we prepare for Christmas, may you find time during the season of Advent, busy as it is, to find time to remove the clutter from your minds and hearts and prepare to celebrate the birth of Christ, the God of all goodness, who brings true peace into our hearts and our homes.